Desperate Chefs' Wives: (Un)Necessary Kitchen Product? I saw a kooky kitchen gadgets on Jay Leno the other night. What do you think about them? 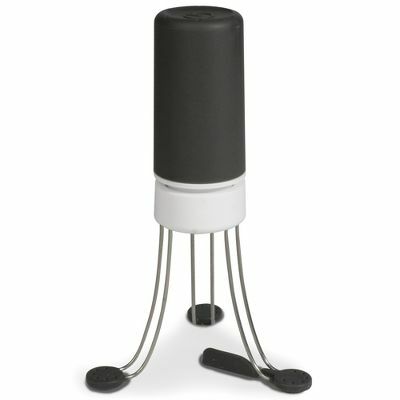 This odd looking alien thing is an auto stirrer for sauces. The Autonomous Saucier keeps the liquid moving in the pan while you occupy yourself with other cooking tasks. No more burned sauces. The product hails from recent Olympic break up-Canada and costs $40. Three silicone rubber feet turn around and keep the sauce moving. Would you buy it? I might, as a gag gift.